SPARSH Hospital was built on the premise that it is possible to build a healthcare model based on best in class clinical and research practice that is accessible and affordable. With the foundation of the hospital based on principles like this it is imperative that that a transparent non profit arm of the hospital exists to drive this vision into reality. Hejje Guruthu : -The SPARSH Hospital and Government of Karnataka Club Foot Programme. Club Foot is a congenital problem and every year approximately 1400 children are born with it in Karnataka. A problem if left treated leads to acute disability, loss of a productive life and very often socially ostracism. In most cases this can be corrected if detected early on. The problem in developing nations is that more often than not its goes undiagnosed with parents hoping that it will correct itself over time. The reality is that it doesn't. It becomes too late for correction turning it into a disability. Accidents are great levellers. They don't differentiate between the rich and poor, social class or religion. The difference between death and life in many cases is medical intervention in the shortest possible time. This becomes particularly relevant when the accident victim is alone or with someone who is also injured. The ability to afford medical help at that point in time should be the least of all concerns. Every person should have the right to receive the best medical assistance possible. Everyone has the right to live. Hence SPARSH Hospital believes that everyone has right to resuscitation. 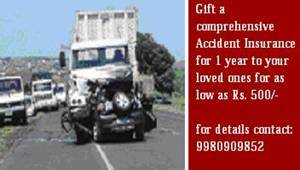 SPARSH foundation will bear all initial costs of resuscitation for unknown patients for the first 24 hours after the accident. Even in instances where there is difficulty in identifying next of kin or family for more then two days, all patients will receive the very best treatment available till their family is contacted. Once the patient is stabilized and resuscitated the patient can choose whether to stay on for further treatment or shifted to any other hospital according to their or their family's personal choice. Cleft Care; 1in 800 live births in our country are cleft patients. Many of these children drop out of school, do not receive treatment, and become social problems for their families. And this is for a problem that can be easily corrected. It starts with recognising that these children are not objects of sympathy, but citizens with the same rights that we all enjoy. SPARSH Hospital runs a cleft lip and palette programme to address this issue. A Primary Resuscitation Centre, in partnership with the Govt. of Tamil Nadu, has been established on the interstate highway at Hosur. All the patients here are resuscitated and stabilized free of cost before shifting them to medical centres. Children In Need - Focuses on extending specialized care to children that require medical care for complex medical problems; e.g. Lakhsmi Tatma - A two year old ischiopagus conjoint twin from a small remote village in the district of Araria of the state of Bihar brought the world attention to SPARSH Hospital. Dr. Patil, on hearing the plight of Lakshmi Tatma who was suffering from this extremely rare and challenging condition, travelled to Bihar in Sep 2007 to bring her for treatment to Bangalore. Over a month after she was admitted to SPARSH Hospital, Laxmi was operated on the 6th and 7th of November 2007. A marathon surgery by a large team of doctors, nurses and paramedical staff led by Dr. Patil operated for 27 hrs at a stretch to successfully complete the separation of the parasitic twin from the body of Lakshmi. A surgery of this magnitude was done for the first time in our country. It won the hearts of millions both in India and abroad. The entire treatment was done free of cost by SPARSH Foundation. SPARSH Hospital is committed to changing the way healthcare is practised in the country. Unless medical and healthcare is made more inclusive, all the advancements and technology that has changing the face of the sector in the country and slowing helping India emerge as the healthcare hub of the world, will by pass the people that need it the most. This is where SPARSH Hospital is seeking to make a difference. The hospital needs support for these initiatives so that it can build scale for these programmes. The Foundation is registered and enjoys tax exemption 80G(5) (Vi) of IT Act 1961 No : -DIT(E)BLR/80G/456/AAGTS 6428J/ITO(E) -3/VoL 2007-2008. The Foundation also needs volunteers in counselling and other support roles. Please contact Dr. Mamatha Patil to explore how you can support these programmes.